To read last week's LRC Week That Was, click Here. To read any 2010 LRC Week That Was, click Here. Our weekly recap is way briefer than normal. We apologize for the brevity in advance but figured it was better to give a little analysis than none at all. Plus, there wasn't a whole lot of action as the pros either were enjoying their time off or getting ready for fall marathons or the Commonwealth Games. Last week, Ryan Hall announced that he wouldn't be competing at this weekend's Bank of America Chicago Marathon and yet when the week was over, the field was actually much stronger than it had been at the start of the week. How can that be? Well, after Hall dropped out, it was announced that Chicago was adding Ethiopians Deriba Merga an Feyisa Lelisa. The 27-year-old Merga is of course best known for being the 2009 Boston Marathon champ. Prior to that, he was best known for pushing the pace for much of the race in the ridiculously fast Beijing Olympic marathon. Hall's PR of 2:06:17 is slightly better than Merga's but considering the fact that Merga is a former Boston champ and was 4th in the Olympics and that he beat Hall in Boston this year, Merga has to 100% be considered to be a better marathoner than Hall. Additionally, Chicago added the 20-year-old Feyisa Lelisa. Lelisa is proof positive that guys are moving to the marathon earlier and earlier in their careers. He made his marathon debut at age 19 when he ran 2:09:12 to win Dublin in October of last year before winning again in Xiamen, China in January in 2:08:47. If two marathons in the span of 10 weeks sounds like a lot, well ... youth does have it's advantages, as Lelisa ran another marathon 14 weeks later - in April in Rotterdam as a 20-year-old. In his third marathon in 24 weeks, Lelisa ran a ridiculous 2:05:23 to finish 4th. So Chicago lost Hall but gained Lelisa and Merga, so the field is definitely stronger on paper. The only question we have is if Lelisa and Merga were planning on doing Chicago all along or if they were added simply because Hall dropped out. At the very least, were Lelisa and Merga training for a fall marathon? We'll probably find out more later this week at media day. The 2010 ING New York City marathon also got a lot stronger last week as it was announced that past champions Marilson dos Santos, Martin Lel and Derartu Tulu would be competing. We are very pumped to see the snake-bitten Lel race again, as he hasn't raced a marathon since the 2008 Olympics. After all of the additions and subtractions of last week, we decided to try to briefly compare the New York and Chicago fields for the men. Form the best we can tell, here are the expected 2010 elite fields for each race. The thing that is remarkable to us is how similar the fields are in terms of PRs. Nearly identical in terms of the number of sub-2:06/2:07/2:08s, etc. In terms of personal bests since 2009, Chicago definitely has a slight edge (but New York gets no credit for having Lel in that stat). Overall in terms of in-form guys (well in form at some point in 2010), Chicago gets the nod as it has the two top stars from the spring, Kebede (winner in London and if we had to pick one guy as the top marathoner in the world right now it would be him) and Cheruiyot (course record in Boston). However, with marathons six months apart it is very hard to tell who is in form now and gives no credit to guys like Keflzezighi (defending champ) and Gebremariam (debut), so that is why you need to watch. Editor's addition at 9:50 pm on 10/6/2010: David Monti who is an elite athlete consultant for New York has written us and it's clear that the field we have listed above for New York is no where near complete. The New York field will end up being really incredible. We don't want to ruin NYC's ability to generate press so we won't announce who else that they will be announcing in the coming weeks. But it's important to note that New York has already secured commitments from three more sub 2:07 guys and 6 six sub 2:08s. In the end, the PRs of the two races will look something like this. As for Hall's dropout, we've got to give him a Thumbs Up for pulling the plug when he knew he wasn't going to run a good race. Hall has been criticized by some as being a quitter, but far from it. It's very hard for a marathoner to admit they aren't in the best of shape and give back a huge amount of money to a race, but it's the right thing to do and Hall deserves props for not just showing up, collecting his full appearance fee and running subpar. That being said, the whole thing to us reveals how often times it's just totally futile to listen to what athletes are saying about their condition prior to races. On September 18th, the Philadelphia Inquirer quoted Hall as saying, "I wasn't totally in top-notch shape last year, but I think I'm in better shape this year." Yet on September 30th after the pullout, Hall told Time Out Chicago that things had actually been going quite badly for the last six weeks. There were a series of bad workouts over the past weeks that certainly challenged my mental toughness, however I would always get up for the next workout believing it would be the workout that would begin to trigger a change in the right direction for me. I did feel like I was on an emotional roller coaster as I got up for the workouts then had to work through the disappointments of having the workouts not go well. In the end, it wasn�t one workout that told me I wasn�t ready it was looking back at the entire buildup and perpetual fatigue I had been feeling for the past six weeks." Admittedly, hindsight is 20-20 but the next time an athlete is quoted as saying he's ready, you might not want to necessarily believe him. And don't even get us started on Twitter (Hall tweeted he was tapering on Sept. 28 - the same day he pulled out of Chicago). The athletes aren't necessarily trying to deceive the public. Often they are trying to deceive themselves into believing they are fit. Other times, they are trying to please corporate sponsors or race organizers. If a top athlete comes into a press conference and says "my training has been going horribly" it doesn't necessarily generate a lot of excitement. Last week, there wasn't a whole lot of actual action, as the pros either enjoyed the off season or got ready for Commonwealths or the fall marathons. But in terms of the amateurs, the NCAA D1 cross-country season heated up as teams went to meets across the country looking for NCAA at-large points. You can follow the action at the links below, as it's too early to really analyze it in our minds at this point. 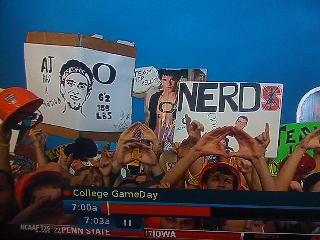 To us, the biggest news the collegiate ranks was the "AJ Nation" sighting on ESPN's College Game Day. What is the AJ Nation you ask? AJ Nation refers to 2005 Footlocker National Champion and current Oregon Duck and 3:53 miler AJ Acosta and his fans. In college football, Oregon routed Stanford and ESPN was in Eugene to cover the action. And in the background of their on-site studio, there was a giant poster of Acosta. See the photo on the left. Now some people in the LRC community are up in arms about the fact that lots of people are talking about the sighting of the AJ Nation. We think they are way off base. To us, it's great to see that college kids can still have fun - even at powerhouse programs like Oregon where the pressure is intense and the head man Vin Lananna loves secrecy. LetsRun.com believes the sign was the result of Mac Fleet and a teammate staying up all night behind the set to get a prime placement. And for that, Fleet (if that's who did it) and his teammates deserve a huge Thumbs Up for being real college kids. Clearly, Fleet is not letting the fact that he ran 3:57.70 in the indoor mile and was NCAA runner-up as a freshmen get in the way of him being a normal college kid. Way to go, guys. Keep on having fun and running fast. "(The poster) is a parody of the Andre the giant poster from Shepard Fairey. Not sure how everyone missed this. But pretty funny actually. http://en.wikipedia.org/wiki/Andre_the_Giant_Has_a_Posse." Monday: "I had a lot to learn. I was out of college, I was a 10K guy on the track and I thought the jump (to) the marathon shouldn't be too bad - I've run a half or two before. I had a lot to learn back in '05 to get me to where I am now." Sunday: "We could repeat our performance at the African Championships and take all the medals." Saturday: "I ran for Canada between 1995 and 2003 (2 OGs, 4 WC). It was a blast and I had some good performances. But the emotional and physical effort that goes into a marathon race is draining. If you invest everything you have for months and then get a bad day, it is devastating. It can set you back for months or years. - Message board poster "Has it come to this" posting about Ryan Hall's decision to pull out of next Sunday's Bank of America Chicago Marathon. Thursday: "Because of this wonderful experience, I am emailing you guys at letsrun to first thank you for your advice (to go and support top American running events in person). But mostly to give a huge thumbs up to Mary Wittenberg and the people of the New York road runners. They were able to make a trip a few college kids took to burn some time on the weekend into one of the most inspirational and awesome experiences of our lives. They truly made our Dreams Become Reality." - Concluding portion of an email LetsRun.com received on Monday detailing the amazing experience four rabid fans from the UMBC cross-country team had at Sunday's Continental Airlines 5th Avenue Mile. The quartet drove up for the race and the NYRR and Mary Wittenberg were so impressed by their spirit that one of them ended up holding the finishing tape. We in turn give the UMBC guys and the NYRR a huge Thumbs Up for representing the very best that our beloved sport has to offer. Wednesday: "I was very excited to run the Bank of America Chicago Marathon but my workouts haven't been good. I'm very much a guy that when I show up at the starting line, I believe everything is possible, and I go after things with my whole heart, so if I'm not ready to go, I'm not going to show up and have a performance that doesn't reflect that." Tuesday: "Being realistic, running a sub-2:47 is really going to take a huge effort."